So God gave me a concrete sign the other day; a sign confirming that Novell was the right place for me to be working. Apparently, Novell purchased quite a few Indiana Jones tickets and it ended up that my boss took our little department out to see the movie the first day it came out. How much more of a sign do you need!?! If an employer supports the adventures of Indiana Jones, then they've already done enough to earn my earnest devotion. So, I thought the movie was a real hit. Harrison Ford did a spectacular job, of course. And bring Marion back into the picture was very clever and provided some closure. Shia did well too, but I held my breath at the end when he almost put on Indy's hat... phew! That was a close one. 1. 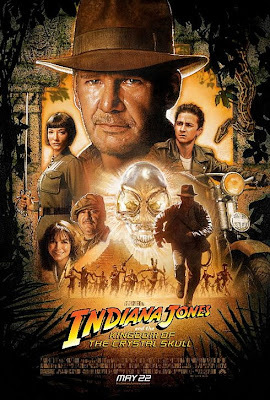 Villain: Indiana Jones is Indiana Jones because he fights the forces of evil single handed. Due to this expectation, it is important to correctly establish the villain as a part of something much bigger than themselves. Nazi's were the perfect example. When you saw Indy fighting a Nazi, he wasn't just fighting the soldier, but the entire force of injustice and evil. However, in this film, the small group of renegade Soviets did not live up to the expectation. You didn't connect them to anything bigger, and even when considered individually, they just didn't cut it. 2. Quest / Subject: UFO's and Aliens? Uhhh.... Indiana Jones looking over the UFO was just a little too much for me, and the ending closed too quickly. For whatever reason (even though I actually enjoy the legends of the Crystal Skulls), the subject felt a little too sci-fi for me. Hey, Tracy: I'm stalking friends' blogs today. A rare activity for me. I should try it more often. A very fun movie indeed! -- But, "I vant to know EVERYTHING! ", then exploding as a painful side effect of omniscience, this was a disappointing terminus to our fiendish, psychic villianess. 'Twould have been better had the skull a dark, pagan connection, and the psychic been, well, more power hungry. A female Rasputin was what was called for. That, and I know everyone disagrees with me, but the kid shoulda gotten the hat at the end. Otherwise, fun flik. I'd still see the next one!